Growing up, Julie and I both had Gerber Baby dolls, and Claire has now adopted Julie's. Gerber Baby isn't usually dressed when I see her, and when we video chatted recently, Claire asked me to make pajamas for her doll. (I suspect this request was prompted by my mom, as GB has big drool stains on the cloth part of her body.) 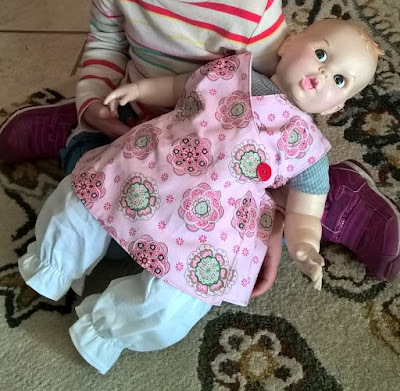 I have made doll clothes for my American Girl doll, but those were hand-stitched and I didn't have to worry about a 2 year old being able to put them on her doll. However, you really can't say no to your adorable 2 year old niece, as she won't understand that you aren't very good at making clothes, so I offered to make a nightgown - which would eliminate sleeves and legs - cutting my mom off as she suggested I make Claire and Gerber Baby matching pajamas, since clothes for Claire would actually have to fit properly. 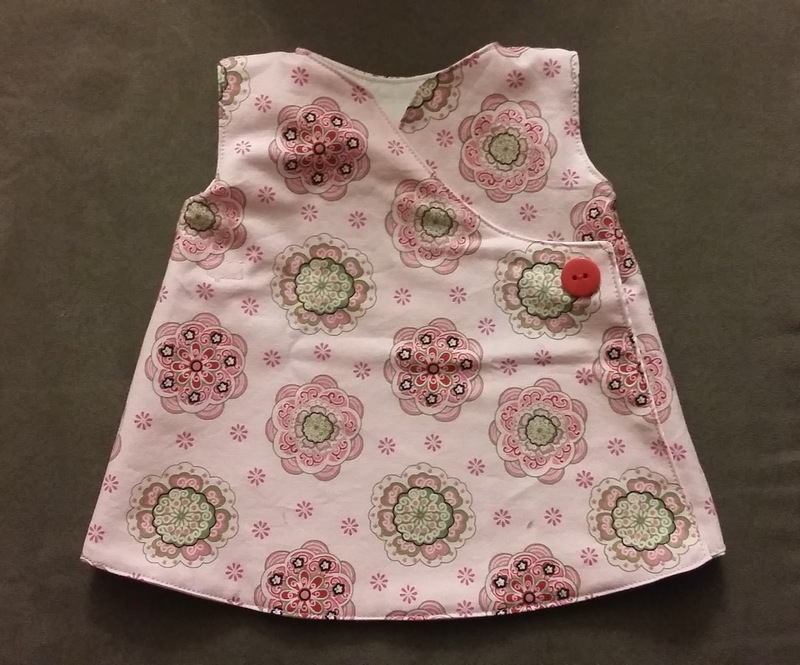 It remains to be seen if this will actually fit Gerber Baby, as the pattern is for a 16" Waldorf doll. 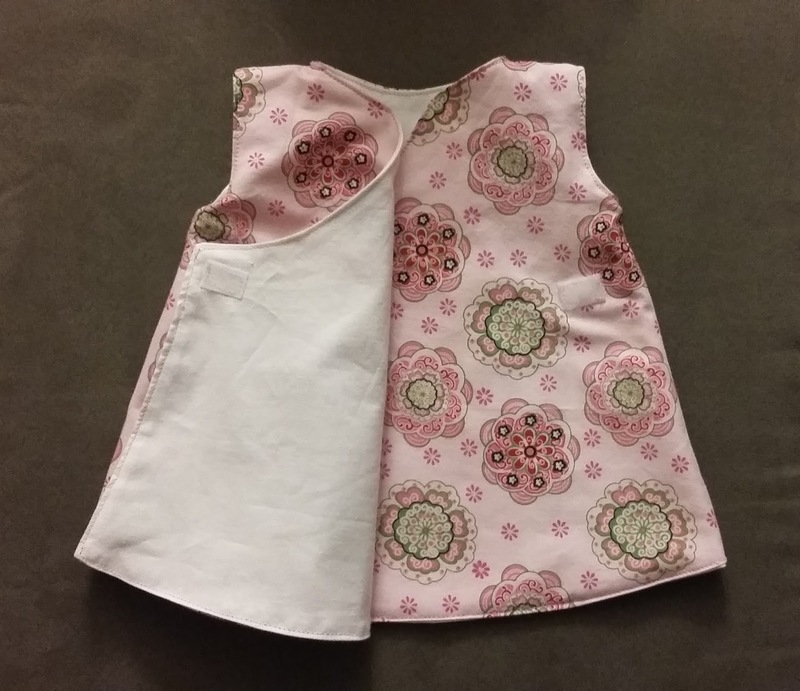 I figured a 2 year old could handle a wrap style dress with Velcro closures, though this one is not reversible, as I didn't think a 2 year old would yet have the fine motor skills to manage the closure on the reversible style. 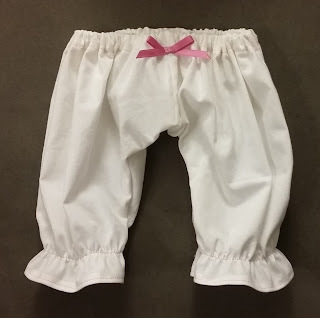 This was supposed to be a nightgown, but after I finished it, I was worried it might be too short, so I decided Gerber Baby needed a pair of bloomers. I used a pattern, making the curve of the leg a bit larger, since Gerber Baby is a bit bowlegged. The legs ended up longer than I anticipated, and I'm concerned they ended up a bit short in the waist, but I'm considering this a test, and I will adjust as necessary once I see how they fit. Hopefully the waist is snug enough! ETA: Here is Gerber Baby all dressed up! Julie said everything fits well enough. The pants are a little long, but they stay up at the waist. It's a bit hard to get her arms in and out of the top, but Gerber Baby has tricky arms, and the top actually looks looser than I expected.